Here are two postcards of the Hall Leys and Matlock Bank, with the four semi-detached houses in Derwent Avenue in the foreground (see previous image). The photographs were taken from Pic Tor. Although they were taken from slightly different angles there are many similarities in what they show, even to the white horse or cow tethered at the junction of the road behind the Dale Road shops and the path leading to the former Cycle Track. The sender of the top card was probably staying at Smedley's Hydro as he or she has marked the building with a large cross. In the bottom left hand quarter of this picture we can see part of Dale Road and the backs of the shops close to the railway bridge. The road behind the shops is a continuation of Olde Englishe Road and the large building with the open sky lights in the bottom left corner (with the card's number on it) used to be the Picture Palace Cinema. The second, browner, card below shows less of the Matlock Bank hillside and the Dale Road shops. A wooden hut is on the Cycle Track grounds, out of shot on the top card, and tram lines for tennis can be seen on the Olde English Ground. There is also a clearer view of the tethered animal although what it was is still uncertain. The football stand on the Hall Leys has been removed (see two earlier images) and there is a marquee at the Park Head end, closer to Crown Square. In January 1912 Matlock Council laid the first sods on the bowling green. The previous eighteen months had seen the transformation of the land from "a waste piece of land into a park". 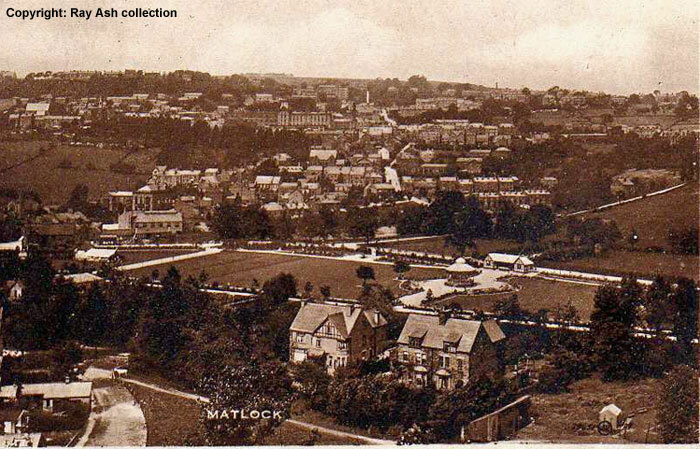 There was some talk about the Hall Leys being renamed as Matlock Park at this time but it came to nothing. Whit Monday of 1912 was said to have been a "charming day" when the Matlocks were crowded with visitors and the road between Matlock and Matlock Bath was described as being "literally black with legions of holiday makers". It was reported that the newly laid bowling green and tennis courts on the Hall Leys proved a great attraction to the numerous visitors. The card's sender wrote that he had "walked over the Hill to Matlock and back", possibly up the Slack, and that he had "no ill effects, beyond stiffness"! the grassed area has been fenced off and prepared as tennis courts. 1. 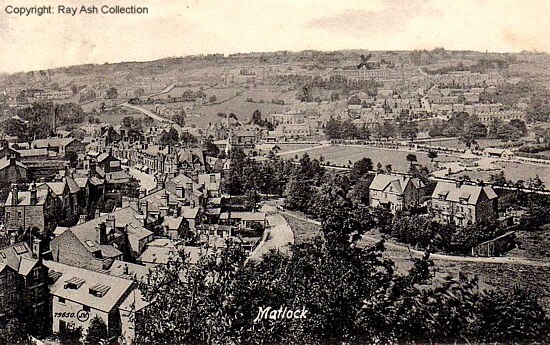 Top card: "Matlock", published by Valentine, No.73850. Posted in 1917 but registered in 1912. 2. Bottom card: "Matlock", Valentine Select Type Series, Copyright Picture, British Manufacture, No. 79651. Registered in 1914. Posted from Ashover in 1922. Another was posted in 1916. Both postcards in the collection of and provided by and © Ray Ash. 2. Enlargement of the second image from a card © Susan Tomlinson collection. "Derbyshire Times", 6 January 1912. The Matlock Park. New Name suggested for the Haw Leys.